It is a good example of a Late Dark Age / Early Medieval dwelling. Though a few of these buildings would have been found in the 15th century. It has a smoke-hole gable at one end of the building, doors each side and a central firepit. 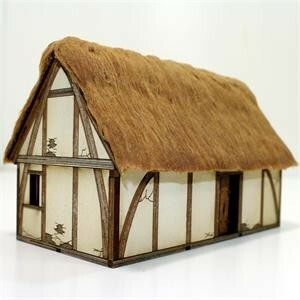 This laser cut model kit is supplied pre-painted with 4Ground base paints, even the thatch fabric for the roof is included, along with doors, firepit and wooden mullioned windows.